is on earned income, your financial sector deals with what you do with the money you have. Until the Sun leaves over the weekend, with the solar spotlight on your financial situation and money matters, this is the point in any year when the focus is on financial housekeeping. 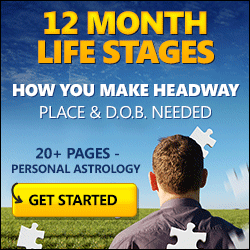 Mercury's return on Wednesday will give you the smart head for money needed to keep your head in the game, just in time for Friday's Full Moon. 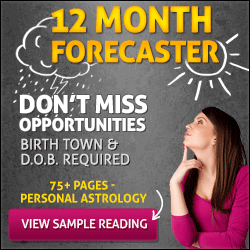 While this is a repeat of last month's Full Moon, what you have this time that you didn't then, was Mars in your career sector. This creates the potential for a breakthrough. Understand your planetary influences. 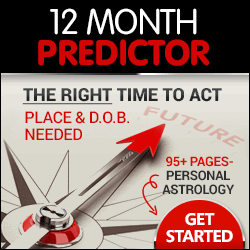 Your Birth chart is based on your date time and place of birth and personal to you. Secrets of a better relationship. How you feel about each other, the way to make a success of being together. Single-mindedness, desire, talent, sensitivity and future possibilities. How to improve your relationship! Identifies the positive qualities you share in order to achieve more happiness together.